As the Subaru WRX Concept car makes its European debut, Subaru has officially announced they are evaluating the 2014 WRX for the UK market. We had heard that the 2014 Subaru WRX was under consideration to be back on the table for import into the UK. Now Subaru has made it official that the next generation WRX is under consideration for the UK market. The old model is now sold out and the decision was taken earlier this year not to import further volumes. While still not confirmed for the UK, it looks like the new-for-2014 Subaru WRX production car will be back. Subaru says, “Changing market conditions has allowed Subaru UK to re-examine the feasibility of bringing the new car into Britain.” The decision is said to not have much to do with demand for the WRX STI but more with changes in the financial markets. An inside source told Auto Express that a recent improvement in the Japanese yen to British pound exchange rate means better margins for its UK dealer network. But more importantly, Subaru has seen a “renewed appetite” for the latest version of Subaru’s most iconic performance model. Subaru is bringing the WRX concept vehicle, that was first shown earlier this year at the New York International Auto Show, to Frankfurt where it will make its European debut. It will be shown at the 65th Frankfurt Motor Show on Tuesday September 10. Subaru tells us that the WRX concept hints at the final look of the next-generation WRX. It features a bold and muscular design “giving it a strong on-street presence.” Look for the new generation WRX to be lower, wider and sleeker than the outgoing model. The WRX Concept gives us a good idea that the 2014 WRX will place an even greater focus on sharp handling and stability, with a low centre of gravity due to the boxer engine that sits low in the chassis. And it will feature Subaru’s famous Symmetrical All-Wheel Drive system. The pronounced bulge on the hood hints at the upcoming power and the “sure-fire” turbo performance. The hood scoop provides clearance for a turbocharged engine and intercooler, while also aiding engine cooling. Another new design feature will be the smooth coupe styling that will be bolstered with a carbon fiber roof. The overall profile hints at the speed and agility of this concept. We should look for a lighter and more agile WRX than in the past. 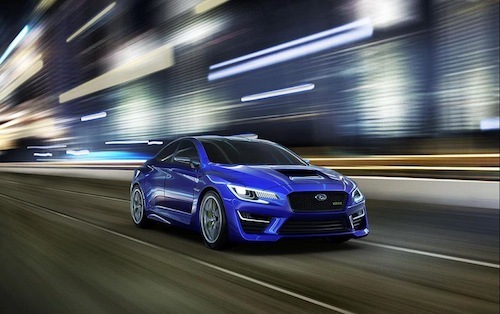 The new-generation 2014 Subaru WRX will likely be sold in the UK as the Japanese automaker evaluates the market. The WRX concept points to the most powerful WRX STI that the brand has ever produced coming in the future. Look for the Subaru VIZIV concept that represents Subaru’s future design direction and vision for technological innovation to also be on the stand in Frankfurt.